Despite its best efforts, Microsoft’s Groove Music service never really caught on. So back in October, Microsoft shut the service down and told its users to switch to Spotify. Unfortunately, that decision had some unintended consequences for Microsoft’s digital assistant Cortana, which relied on Groove Music’s library to help people identify songs. This change was uncovered by Windows Central, which found a tweet from Cortana developer Jason Deakins. Due to Groove’s shutdown, Deakins said Cortana will no longer have the ability to listen to and identify songs played into the microphone of a compatible device. “What you are seeing is expected,” he said. Now that Apple owns Shazam, which has long been among the best at identifying random ditties, Microsoft now has one less partner to help Cortana potentially regain its tune-tagging smarts. However, now that Microsoft and Amazon are trying to work together on Cortana and Alexa, it’s possible that with their combined powers, these companies will figure something out. (Echoes can’t identify songs either, unless you say the lyrics yourself). 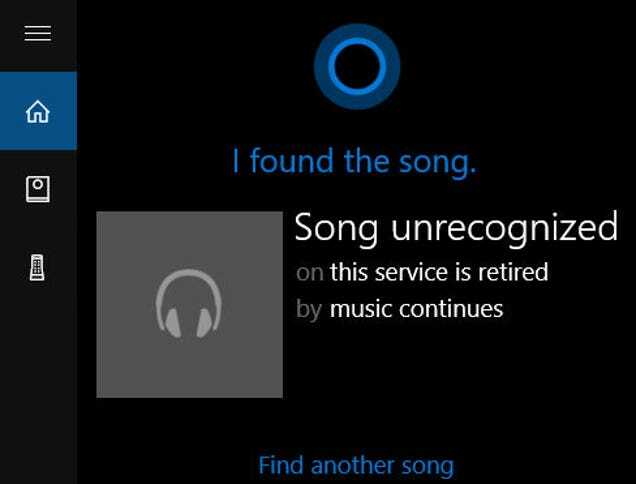 When we tested Cortana for Android this afternoon, the app spat out a confusing error: “Song unrecognised on this service is retired by music continues.” On Cortana for iOS, the query returned unrelated search results.